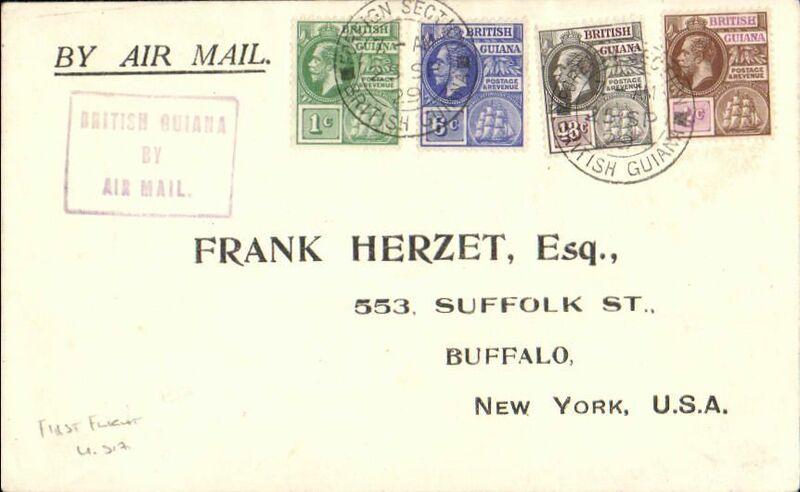 F/F FAM 6, Georgetown to Miami, no arrival ds, printed air mail cover frankedviolet boxed "British Guiana by Air Mail" cachet, Pan Am, flown by Lindbergh. 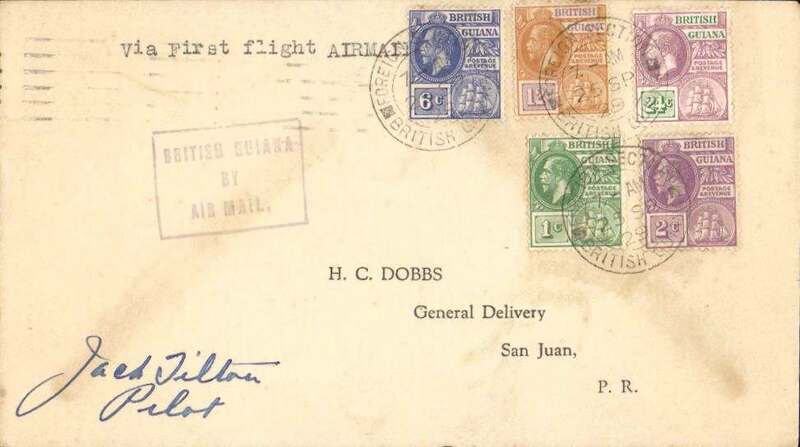 F/F FAM 6, Georgetown to San Juan, bs 26/9, plain cover franked 45c, canc Foreign Section/British Guiana 25 SP 29 cds, no cachet, Pan Am. 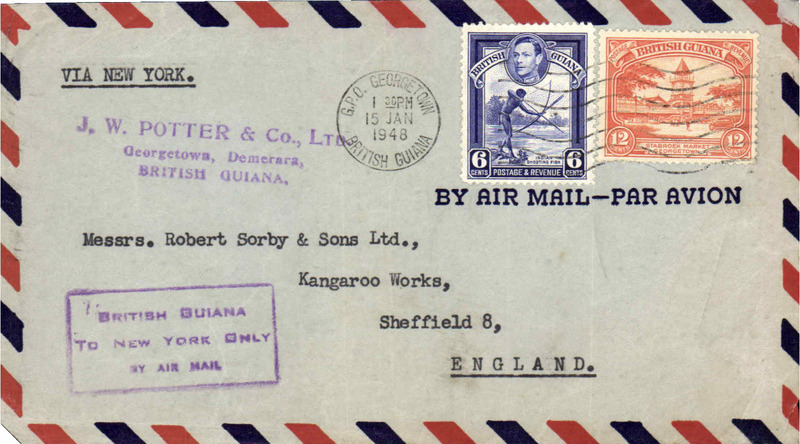 Flown by Lindbergh to Port of Spain, then Jack Tilton to San Juan. Signed Jack Tilton, pilot. F/F FAM 6, Georgetown to Miami, no arrival ds, violet boxed "British Guiana by Air Mail" cachet, bs 26/9 Pan Am, flown by Lindbergh. 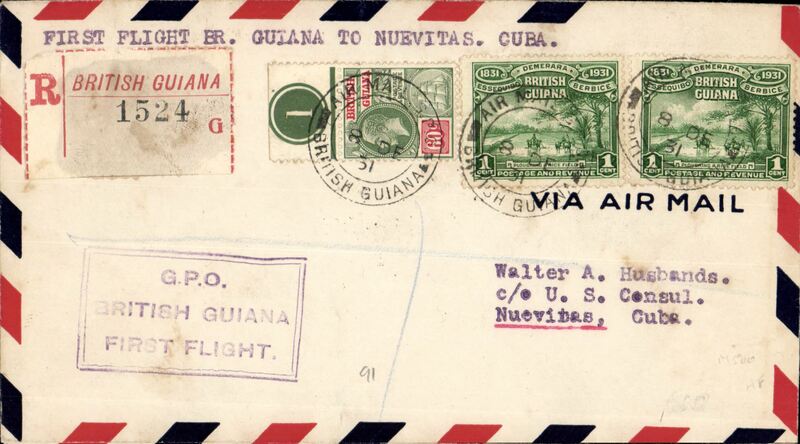 Pan Am F/F British Guiana to Nuevitas, Cuba, bs 108/12, registered (label) airmail cover franked 62c, violet framed F/F cachet. 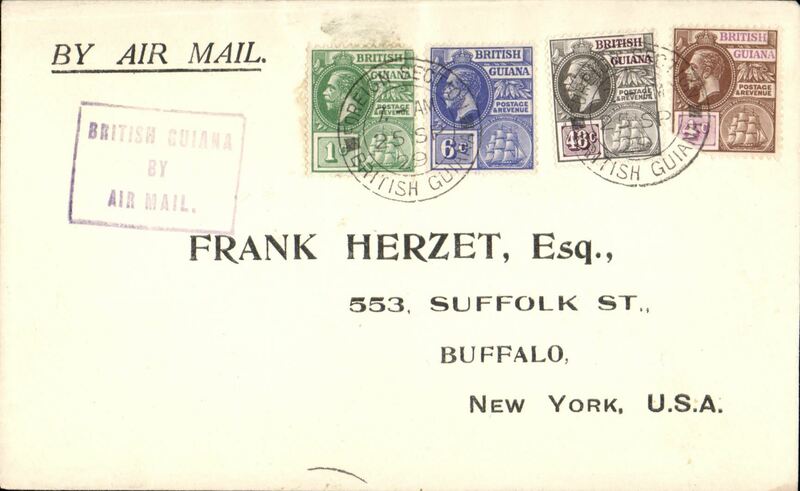 Flown commercial cover to England, no arrival ds, franked 18c tied GPO Georgetown machine cancel, typed "via New York", violet boxed "British Guiana/To New York Only/By Air Mail" Jusqu'a . 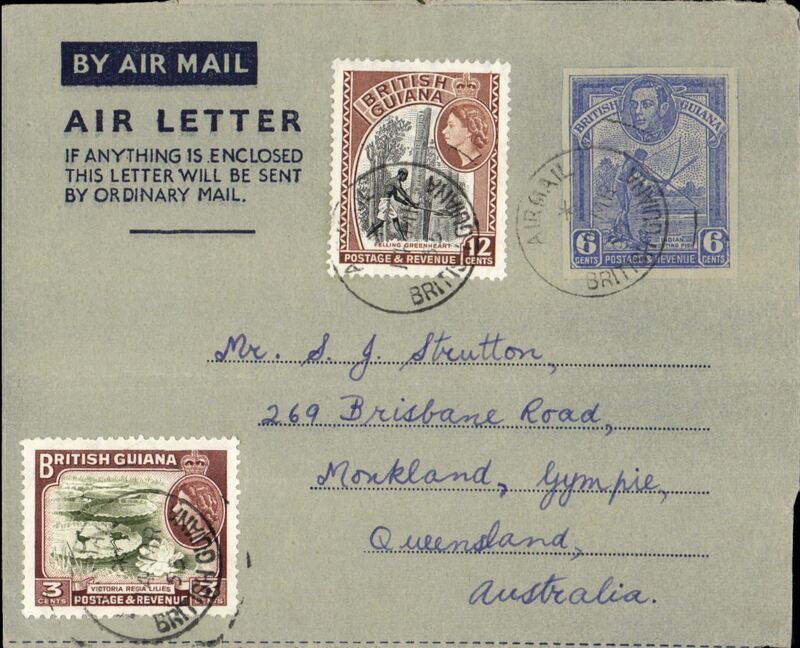 British Guiana to Australia, dark blue/grey KGVI 6c air letter franked with additional 3c and 12c stamps, verso photo view of Kaieteur Fall. 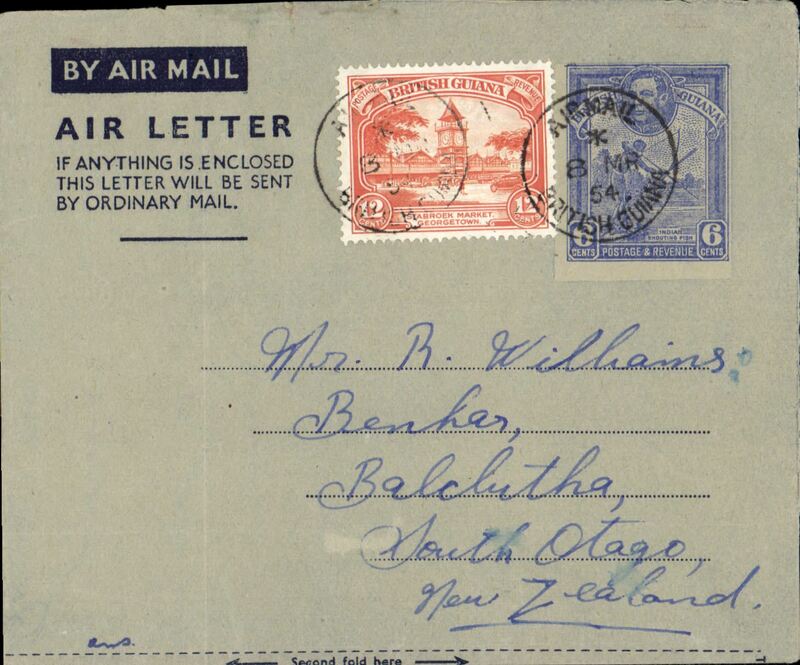 British Guiana to New Zealand, no arrival ds, dark blue/grey KGVI 6c air letter with additional 12c, verso photo view of Kaieteur Fall. Uncommon origin-destination combination. 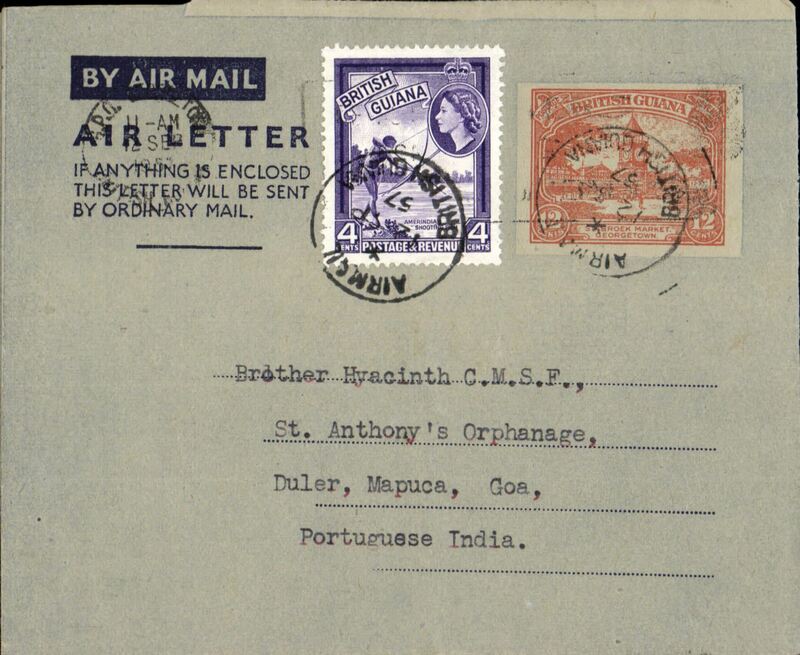 British Guiana to Portuguese India, bs Mapuca, Goa 26/9, dark blue/grey air letter franked 16c, verso photo view of Kaieteur Fall. Uncommon origin-destination combination. British Guiana to Australia, dark blue/grey air letter franked 21c, verso photo view of Kaieteur Fall.